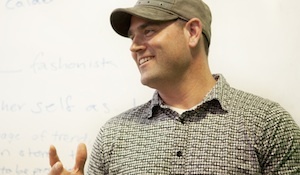 Matt Rother, co-founder of FEED Collaborative. Photo Credit: Feed Collaborative. Currently, the world’s food system is in a state of flux. Small growers across the globe attempt to impact their local communities by producing organic food that challenges traditional food production. The students of Stanford University’s FEED (Food Education Entrepreneurship Design) Collaborative intend to impact the food system in another way: human centered design. The FEED Collaborative began when Stanford lecturer and fellow Matthew Rothe and Debra Dunn, former HP executive and faculty member, used their human design approach as part of Dunn’s research on ‘Design for Sustainable Abundance.’ Students were challenged with reducing meat consumption in one of the school’s cafeterias. Taking some of the issues our current food system faces, turning them into academic exercises and then sharing the solutions with food system stakeholders to make real change is the goal of Stanford’s FEED Collaborative and it seems to be working. Rothe refers to the approach as a multidisciplinary experiential education that brings different groups together. “We believe that innovation and breakthrough ideas happen as the result of a diverse group of people working collaboratively and we are very thoughtful in this regard about the composition of students in our classes, as well as in the formation of student project teams,” states Rothe. Students from all seven of Stanford’s schools take part in the FEED Collaborative. They work with local organizations invested in the food system in some capacity. A recent project involved the FEED Collaborative working with Collective Roots, another collaborative based in East Palo Alto to form solutions to improve food security for the underserved population in that specific area. Collective Roots’ mission is to involve students in making change in the food system making them a perfect partner for the Stanford based initiative. There is always the concern that student led projects that involve real world problems can lose funding or assistance when the students concerned finish the semester or graduate from college. Rothe is very aware of this issue and takes real steps to ensure projects are sustainable. An underlying force in the FEED Collaborative seems to be teaching the students the role of empathy in food system understanding; taking academic exercises and making them personal and poignant. Students around the world are now studying the many aspects of environmental science, sustainable agriculture and green technology but often the ethical and empathetic approaches necessary for sustainable change are overlooked. The FEED Collaborative’s approach ensures empathy goes hand in hand with learning. The collaborative part of the Stanford think tank involves not just the students, but the folks they work with in the real world. It must be a two way street for anyone to see concrete results. Often we forget there is more to fixing the world’s relationship with food and health than those we have already experienced. We must remember that we are still at the beginning of this green evolution and the work of students in the FEED Collaborative and others like them could become foundational to how we approach meeting the healthy food needs of the world in the future. The FEED Collaborative is currently developing relationships with small growers and others that believe in the concept of social entrepreneurship. Rothe grew up on a corn farm in Colorado and has worked in the food system in a number of capacities over the years. Together with Dunn, he combines his real world experience with the sustainable food system classes he teaches his students. Their work with the Collective Roots organization has become the current focus of the FEED Collaborative.